In the beginning of January 2010, my guide Guipago or my man G as I like to call him, started visiting me with an increased vengeance. In the first few years after our initial encounter — although he did come every once in a while and impart his wisdom and sarcasm — there was to be no comparison for what I was about to experience. 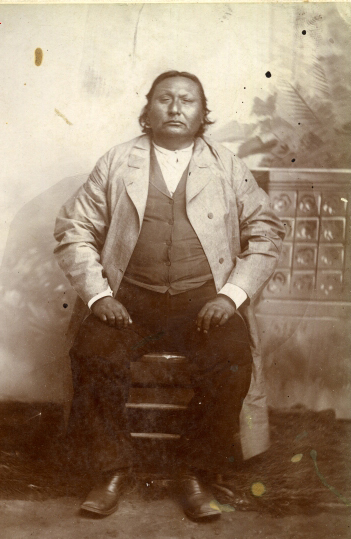 Guipagos intention was to get me away from my sometimes lackadaisical attitude toward my connection with both the Kiowas and the whole Native American Experience in general, and get me moving. He meant to educate me and assimilate me into everything Indian — ironically enough, just as they had been forced to assimilate years ago. I was getting ready to be schooled G-man style! This extraordinary chapter of my journey started one day when Guipago was talking to me and he guided me to a photo that I found on the internet. When I saw this photo, an overwhelming feeling of sadness came over me. I felt my entire body tighten up and I immediately began to bawl my head off. I couldnt take my eyes off the photo — in fact, I would ultimately end up sitting freezing cold in my basement for hours just staring at the computer screen and crying over this photo. I couldnt believe that I hadnt noticed this one particular Indian before. I had searched many times for images of Guipago, and I did stumble onto photos of Santanta and Satank — but never this person. My only thoughts were that I subconsciously blocked him out and didnt notice him, or perhaps Guipago was saving him for when I was ready — I am leaning towards the latter. my heart just completely sank. I couldnt then and still cant at this moment, put into words the immediate feelings and emotions I had toward this guy. If you are an intuitively gifted person yourself — I am sure you can feel me as you are reading this. Although I have only been on my conscious journey with Big Tree a relatively short period of time, so far, he has already managed to turn my life upside down and completely change the way I look at things and remember things. I will never forget the day Guipago introduced me — or should I say reintroduced me to Big Tree — it was a particularly poignant moment in my life and I will always be forever grateful. I was now on a new spiritual mission and quest — and my life would never again be the same. In the days that followed, I became obsessed and decided I had to know everything about Big Tree. When I say I had to know, I am not talking about reading books and articles about him — I had to experience him, be him, feel him, see through his eyes, smell through his nose and travel in his very footsteps. Armed with this burning desire to acquaint myself with Big Tree, I quickly learned the basics about him via Google, and knew that I would soon be taking a journey through the northern part of Texas and Southwestern Oklahoma. The first part of my journey started with a flight into Texas. R picked me up at the Dallas Airport in her little red horse and together we rode off into the horizon towards Jacksboro — the first stop of many on our Big Tree Adventure. 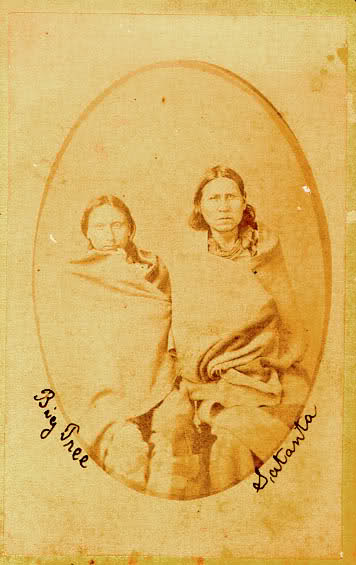 While I am not here to give you a history lesson, I did find out that Big Tree lived around 1841to 1929, and because of his participation in the Warren Wagon Train Raid aka the Salt Creek Massacre, he along with Satanta, was the first Native American to be tried in a United States Court. I found this revelation very interesting and although I didnt know much about the trial, from what little I did know, I knew intuitively somehow, I didnt agree with it. I suppose whether I agreed with it or not wasnt really the point — I just really wanted to see where this event took place. When we finally rode into Jacksboro, we made it a point to head straight over to Fort Richardson in hopes of getting information about the courthouse and trial location. Sure enough, as fate would have it — and since it was early evening — the Fort was actually closed. In my usual Kathleen Style of determination — which translates to I didnt travel all this way for nothing gosh darn it! — I decided to walk around and look for some signs of life. Fortunately for us, we were able to connect with one of the employees who worked there. He was a wonderful guy named S, and although I didnt dare tell him everything about my quest — we did manage to get into a lengthy conversation about the atrocities committed against the American Indians and the way they were currently being treated by the government. He had a lot to say, and after almost a half an hour of talking and swapping opinions went by, he not only informed us that he himself was part Indian and a proud card carrying member of the Shawnee — but much to my disappointment, informed us the original courthouse in town where the trial had taken place no longer existed. I thought to myself, What a freaking bummer!. Initially, although I was very disappointed, I quickly decided it didnt really matter! 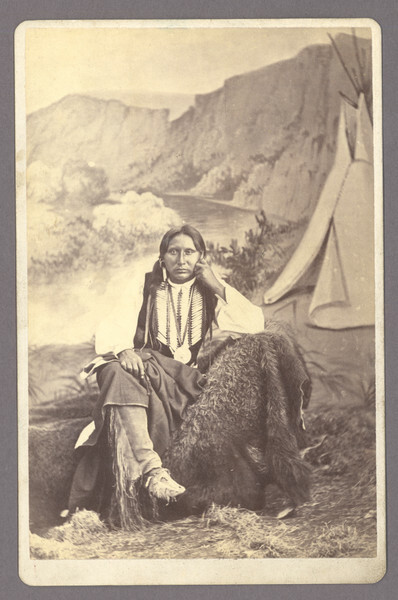 I was content just to be there — to see the scenery, hear the type of birds Big Tree may have heard, smell the air and try to connect with he and Satantas experience. Time was going by very quickly, so we promptly thanked S for his knowledge and information about the Fort, Courthouse, Indians and his brilliant recommendation on where we could get some great Mexican food. That was it! We were off — on our way to the site where the old courthouse once stood, and where the historical trial of Big Tree and Satanta once took place so many years ago. As we drove over to the location, I felt a bit odd and apprehensive. In fact, I was uncharacteristically quiet for the most part, as I wanted to soak up every image and detail I could. Upon our arrival and finding a place to park, we began to walk around the grounds. I can only describe the moment and my feelings as that much overused word I dont really like to use — but I have to inject it here — It was completely surreal. As I listened to the chirping of the birds, I could feel my mind drifting to another space — another time. The outside world quickly became very blurry, and for a short moment I was transported and connected. How incredible it felt to actually be there. I wasnt in any hurry to leave my current reality, but as all things must go in life — it was getting late and we needed to make a move. R and I walked around the area for a little bit longer, all the while picking up whatever vibes we could. We began to feel a chill in the air, and noticed the sky turning from a gorgeous hue of cornflower blue, to an absolutely striking shade of vermillion. We stood in awe, gazing at the incredible natural beauty that surrounded us. We were extremely grateful to be in such a wonderful moment, and as the Sun symbolically began to set, we proceeded to do what I always do when I go to Texas — go to the best gosh darn hole-in-wall Mexican Restaurant I can find! Can you say rice, beans, guacamole, homemade tortillas and cheese enchiladas? after an excruciatingly sleepless night in Wichita Falls, we threw the suitcases in the trunk and burned rubber leaving hoof tracks behind as we headed up the highway to Lawton, Oklahoma. I was extremely interested and intent on going to Fort Sill and the area around it. Again, without going into a huge history lesson — and to be painfully honest, I couldnt even if I wanted to — Big Tree was arrested there by that crazy fart General Sherman and incarcerated. I really want to refer to General Sherman as a big prick — but since I am supposed to be all love, light, kumbaya and peace to all people — I guess I better not! Continuing on with my story, it was a Sunday the day we drove to Fort Sill and like with the rest my haphazard planning — unfortunately, everything would be closed. I would say the entire shutdown of the post was a total bummer, however I would later come to discover — being forced to return on another day, was all just part of the bigger plan of Guipago and Big Tree. They were saving something much bigger for me! I had never been to Fort Sill before or at least so I thought. When R and I drove onto the post that day, I recalled that I had seen certain parts of it before in a dream. There was a row of officers housing that I knew I had recognized and that sudden feeling of déjà vu — feeling and knowing I had already been there. In our typical style of traveling, as usual, we didnt really know quite where we were going, and as we so often do — we like to drive around in circles to entertain ourselves! Yippee!! After several minutes of enjoying our favorite activity of driving around in circles with no ultimate destination in mind, we noticed a road that seemed to lead up a hill. We were both very excited to make this groundbreaking discovery and so, in our little red horse, we began our ascent. As we drove up the hill towards what I would later find out was the location of the arrest, General Shermans House and the Old Commissary and Jail — I began getting very ill and nervous. I told R that I might be sick, and that we were probably getting ready to stumble onto something significant very quickly. A few more seconds of driving went by, and then — there it was — the old and original part of the base. We quickly parked the car and got out to walk around the square where the historical buildings remain intact. We tried to look through some windows and take some pictures, but as everything was shut down, we werent really very successful. We decided to salvage the visit somewhat by trying to locate the gravesite of Geronimo. Although, once again I am embarrassed by my lack of knowledge — this time to include knowing anything significant about Geronimo, other than he was an Apache Indian and was supposed to have some strong mojo — I did want to find and visit his grave. We set off and started driving again to this time what felt like no-mans-land. I have to input here that I was shocked and I do mean absolutely shocked, when we drove towards what seemed to be the back of the base, and we came upon a fork in the road with one sign saying something about a landfill and the other sign saying something about the gravesite. I laughed in my head not because it was funny, but because I just couldnt believe that someone of so much historical significance could be buried out next to the landfill area of the base. I would unfortunately come to learn however, this type of occurrence and treatment — not to mention the complete rewriting of United States History in regards to the Native Americans — was not only common practice — it was blatantly typical. We drove down the road leading to Geronimos Grave and I dont actually know what I was thinking at the time, but I was not mentally prepared for what we were about to stumble onto. When we arrived, we discovered it was not only the gravesite of Geronimo — but the burial ground of several other Indians as well. I began to walk around for a minute or so, and as I read the names of Apache Men and Women on the headstones, I could feel all these emotions coming up to the surface, ready to spew out at any second. It was like this giant mixture of unexplainable sadness and anger. I wasnt really sure what I was feeling but it was quite overwhelming and I didnt really know how to handle it. I continued to walk around the burial area for a few more minutes, while I tried unsuccessfully to get a better grasp on my feelings. A large part of me wanted to stay and look at all the names, but to be completely honest, I didnt feel very comfortable there as for whatever reason, I felt I was intruding. I dont really know how to explain it — but I just wasnt really feeling right about being there. R said she felt the same way — so without any hesitation, we quickly decided to leave the area. We knew we would have to return to Fort Sill on another day, so we jumped back into our little red horse and headed off toward Medicine Park and Mount Scott. I had read that Guipago was buried somewhere along, I believe, the north slope of Mount Scott and it was very important to me to visit the area and pay my respect and gratitude to him for everything he had done for me up to this point. 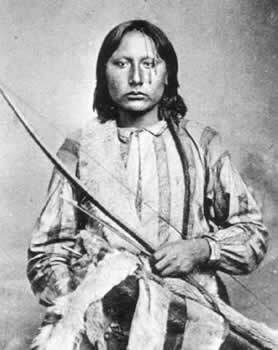 I knew Guipago wanted me to go there as well, as a day or so before the trip, he himself helped guide me to discover a Kiowa Legend about Mount Scott opening up and the last of the buffalos walking into the mountain. This time things would be a little easier as R and I would only have to drive in semi-circles to find our destination. It was a daunting drive up to the summit, but after reaching the top, we got out of the car to take it all in. For the next several minutes, we both stood there like zombies with our jaws hanging open. Finally, we just both looked at each other and said WOW!. There really arent any perfect words to describe the euphoric feeling you get when you stand at the top of Mount Scott and look out across all the land and lakes — it is absolutely incredible. For me, I had the feeling of sort of like automatically jumping back into time and gaining the knowledge — or should I say remembering what it felt like before all the trains, cars, airplanes and corruption of the lands. I could feel the spiritual power and presence of the Indians and buffalo who at one time — once roamed freely. I felt as though I had crossed over into another dimension without even trying — and believe me, it was another dimension I never wanted to leave! I paid my respects to Guipago and thanked him profusely for guiding me to such a heavenly place. It was extremely difficult, but R and I finally managed to pry ourselves away from the spectacular view and we drove back down the mountain. We were both feeling really good and noticed in each others appearance and demeanor, that both our energies seemed to have changed significantly after our interaction with the spiritual forces at Mount Scott. 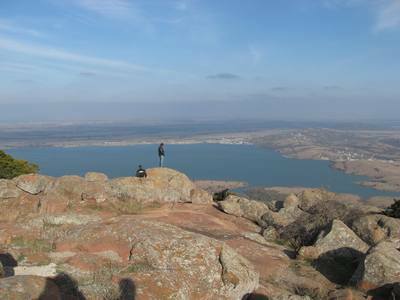 Not in any hurry to leave the area and lose the sensation of being high on life, we decided to drive around the Wichita Mountains Wildlife Refuge Area for awhile. We were hoping to see some buffalo and although we ultimately didnt see any, I did manage to spot what I thought might be some buffalo droppings near a small lake. I am certainly no expert at identifying animals by their leftovers — but hey, I was totally caught up in the moment of being back in the days, and I was having fun! We traversed the refuge area spotting several gorgeous Longhorns on the way, and even stopped for a while at a little Prairie Dog Village. There was one particular Prairie Dog who apparently thought he was auditioning for a spot on Top Model. Every time I would take a picture, he would hold the pose until the flash went off, then he would immediately go into a new pose and freeze. He was absolutely hilarious, and although I could have stayed all day photographing him, it was getting late so we had to continue onward. We made our way to Medicine Park, where we took some token tourist pictures standing next to a giant buffalo statue, had a drink and then headed back towards Lawton for another — yes, you guessed it — another great Mexican Dinner! That next morning, after a another particularly dreadful nights sleep — this time, in Lawton — we got up early and headed towards the Museum of the Great Plains. I had read about the museum on one of the travel brochures and wanted to check it out. Our visit was good and although the museum itself was fairly decent and enjoyable, I was a little disheartened when I picked up a dream catcher in the gift shop and the tag said made in china. Aargh! Is there nothing sacred anymore? As you can imagine, after my sensibilities took a direct hit, we didnt spend too much more time lingering in the gift shop! We practically knocked each other over as we sprinted to the car — then once again, we headed out! What would happen next would be one for the record books, as we ended up being guided to Quanah Parkers Star House. The whole ordeal of going to Quanahs house is a story in itself, so I will discuss it in more detail in my story Adventures at Star House. 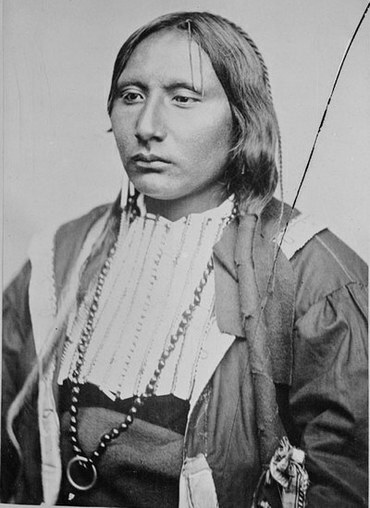 I can tell you for now, that as usual, once again my lack of knowledge precedes me and I didnt know very much about Quanah Parker. I wasnt really sure why we were guided there, but I knew it probably wouldnt take to long to figure it out. After all, when we arrived at the house, there was the spirit of a little boy and Quanah himself opening the front door to welcome us and let us in! I was very excited to not only be in Quanahs house, but I felt absolutely honored and privileged that he himself was there with us to give us the tour. As with many other of my experiences, it is really difficult to describe what it is like to connect with a spirit on such a profound level, so I am not going to even attempt it! As we began to walk around the house with our this life and other life tour guides, I was drawn straight away to the kitchen and dining room area. Wow! The energy in the dining room was fantastic! There was a very long table with several chairs around it and I could hear the low din of psychic voices from the past. I was really getting into it as I was vibing out the place, when I suddenly heard Rs voice calling me. She was calling me over to look at something she had discovered. There at one end of the room sitting on top of an old stove, was a small framed sign. R said, hey, look at this and she pointed down to the writing. The sign read that back in the day, Quanah had many special guests at his house, and that many had sat right at that very dining room table. There were several historical figures listed, and as I continued to read down the names, I almost passed out! To my surprise and absolute delight, lo and behold, right on the placard were the names Big Tree and Guipago! I was absolutely ecstatic and I could feel the huge smile across my face. Up until that moment, I just thought I was having this freaking amazing out of this world experience with Quanah Parker! If I was still having any lingering doubt or uncertainty whatsoever about why I was there now, I was no longer confused! When I saw the names of my man G and Big Tree on the list, it didnt take me long to figure out it was in fact Guipago and Big Tree themselves, who guided me there. It was all part of their master plan to educate me about every aspect of their lives, including introducing me to Quanah himself, as he is way too groovy for words! After an absolutely brilliant day at Star House, we made our way into the Quartz Mountains. I had no idea when I booked a reservation, that our hotel was in fact located right on or right next to the Kiowa-Comanche-Apache Reservation. Whoopee!! Our trip may have started out with a few missteps here and there, but since our visit to Mount Scott, and with the continuous guidance from Big Tree and Guipago, everything was picking up speed and now falling into place! In fact, the very first night at the hotel, after what was already an extraordinary day, I was woken up in the middle of the night to an Indian doing a call or scream. I apologize for not knowing what the proper term of the yell is — or if in fact there is even one at all — but I distinctly heard the cries of a male Indian. Even though I was half asleep, I figured out very quickly that the male Indian was in fact — Big Tree. He was out on the top of one of the mountains that surrounded our hotel, and apparently, he was intent to get my attention. It was way cool and I was excited beyond belief. I quickly jumped out of bed and ran to the sliding glass door. I pulled open the curtains and looked out toward the mountains. I couldnt see anything, but I could feel his presence, and I knew he was there with me. I also knew in my heart and with my every breath, that with his every scream — he was letting me know we had a special bond that transcended space and time. From that moment forward, my life would change drastically and I would begin to see through a different set of eyes. Big Tree and Guipago werent just some of my spirit guides, and the Kiowa Indians werent just another tribe — they were a part of me and I was a part of them. where do you want to get breakfast?. It isnt that my friends dont take me seriously, or lack interest, its just that so many bizarre things happen when they are with me, they tend to get immune to it. Personally, I wasnt really too concerned about eating breakfast that morning, the first thing on my agenda was to find the Rainy Mountain Baptist Church. I was intent to visit not only because I read Big Tree had converted to Christianity and was actually a deacon there for several years, but more importantly, it was the site of his final resting place. We started off having one of those driving around in circles days trying to locate the church, and although it was out in the middle of nowhere, we did manage, and finally found it. As we drove up towards the church, we looked at each other in excitement. Together, in perfect harmony we exclaimed, Alright! It looks like it is open!. From a distance, it appeared the church lights were on and someone was in there. As we got closer and pulled into the empty parking lot, we suddenly realized these werent any ordinary lights. The church seemed to be taking on a life of its own as it was emitting this incredible blue light from all the windows. I wasnt sure what to think, so I just sat there for a minute in contemplation. the church is glowing, were in the middle of freaking nowhere with no one around for miles, and she is telling me to go all by myself and check it out! Thanks R — mighty kind of you! I timidly went up to check the doors, and although I was afraid to look in, I finally mustered the courage and went for it. I stuck my face up to the glass and wowsa! There was a brilliant blue light just in the middle of the church that illuminated the entire place. I wasnt really sure what was actually happening. Believe it or not, sometimes I am a skeptic myself, not about the paranormal, but about my own abilities and what I am actually experiencing. but hey, no big deal. After calming down and trying to get my breathing regulated, we went over to the graveyard closest to the church, and looked for Big Tree. We saw he wasnt at that location, so we drove over to the other burial grounds that were back behind the church a bit further away — um, the one back by the woods where its kind of scary and nothing else is around. It was a very cold and windy day so once again, my dear friend let me get out and investigate all by myself while she sat toasty in the warm car. I began walking around the grounds, and I was once again overcome with every kind of emotion you can possibly think of, but I tried to remain strong and find his grave. I dont know what my problem was that day, but for some reason I apparently didnt want to, or perhaps I wasnt ready to find his final resting place. I was getting very cold and convinced myself somehow that I had gotten the wrong information, and Big Tree wasnt there at all. I decided I needed to check my facts again and make sure he was indeed there, and if so, come back the next day. or some other unseen force grabbed hold of my leg and wouldnt let me go. To an outside observer, I am sure it all must have looked like one of those terrible horror films and probably just as cheesy. I stood there screaming like a lunatic while I struggled to get my leg free. Whatever it was, finally let me go and I fell down right on my backside. I woke up very early the next day thanks to hearing Big Tree whistling for me to get up. We got an early start and we drove all the way to the Kiowa Tribal Headquarters in Carnegie so I could make sure I had my facts straight about Big Trees burial location. While at the headquarters we had the distinct pleasure of speaking with a very informative Kiowa man and woman. They were very helpful — but also incredibly both extremely biting and sarcastic. I laughed simultaneously both out loud at their jokes and privately in my head, as I couldnt help realizing I had experienced the same sardonic wit in my previous interactions with Guipago. I began wondering if this cynicism and specialized style of humor was part of being a Kiowa. We drove once again back toward Rainy Mountain Baptist Church and the KCA Burial Grounds. This time on the way over, I was really angst-ridden and felt as though I could barely breath. I knew this was it and for whatever reason, completely unknown to me — I was incredibly nervous. I asked R to get out with me and help find his grave, as I intuitively knew my mind would not allow me to find it on my own. I guess in my subconscious somewhere I knew I didnt really want to see it. Isnt this what you are looking for?. I took a deep breath, and then I looked down at the inscription which read, Big Tree – born 1841 died November 27, 1929. I could feel my heart sinking down to my knees as I just stood there in silence. I really didnt know what to say, or how to say it, so I ended up saying nothing. R sensed I wanted to be alone, so she said she would go back to the car to read. There I was, alone at the gravesite of someone I had to know everything about. I sat down on the ground and began talking to him in my head. Although I had waited for this one special moment, I found myself feeling oddly unemotional and detached. I wasnt sure why we didnt seem to be connecting and I began to entertain the idea that perhaps he really didnt want me there after all. I spent a few more minutes arguing with myself in my head, and finally came to the conclusion Big Tree wanted me to leave. I wasnt able to shake this thought or change my perception, so I reluctantly got up, said my goodbyes and started walking towards the dirt road. I was almost at the dirt road, when all of a sudden and completely out of nowhere, this huge freak wind came and stopped me dead in my tracks. I call it a freak wind because it was a beautiful sunny day and there was no wind to be had anywhere. The wind itself was so strong that it began pushing me back toward the grave of Big Tree. As it almost knocked me off my feet, I knew for whatever the reason, he wasnt ready for me to leave and it was he in fact, who manifested the sudden tornado-like weather. I turned around facing his direction and let the wind help blow me back as I walked to the site. Once again, I sat down on the ground and then just as I predicted — the wind completely stopped. I smiled and said, So I guess you wanted me to stay huh?. No sooner did I utter those words, when all of a sudden this huge surge of emotion came up and I began to bawl my head off uncontrollably. I must have really been repressing my feelings for some reason, because now I was so overwrought with emotion I could barely contain myself. I had the sense of being torn away from someone who I was once very close to, and of missing them badly. I must have drifted off to another place, because I was apparently pretty out of it. I dont really remember much after that, except getting in the car slightly embarrassed and hoping R wouldnt see I had been crying. I only remember her uttering the words, did you do what you had to do?. I said, yes and off we went. I continued to walk around in a fog-like state for the remainder of the day and deep into the night. I couldnt get my mind off of Big Tree and thoughts of our visit together. I must have been mentally and psychically exhausted, because I dont even recall going to bed. For the first time since we started our journey, I actually managed to have a half-way decent sleep. It was my fondest hopes that once again I would be woken up to the sounds of Big Tree, but he didnt show up that night. I guess he must been exhausted himself and thought we both needed some rest! I have done what I needed to do. I think she was a bit relieved and ready herself to do some more exploring — after all the Quartz Mountains are such a beautiful peaceful place. We got back to the hotel, changed our clothes and started off on one of the walking trails that goes through the mountains surrounding it. The very first sign I came to on the trail said the Kiowa Indians used to camp out in those very mountains as they shielded them from the wind and gave other protection against the elements. What?! Kiowa Indians used to hang out in this very location? I had no idea! I thought back to what Big Tree had told me about seeing what I find. It was funny to me that I had been there in one of the same places they used to hang all that time and I didnt even know it. R and I walked some more and stumbled upon a nice little lake which was hidden in between all the trees. After we rested for a while, we walked back to the car and drove a few miles to some other trails that go up the Quartz Mountains. I mentioned previously that my friend is kind of nonchalant about my psychic stuff and what can manifest when we are together — well today would be no different. While we were walking through the trees, R, calmly and completely void of all emotion, turned to me and said, I just saw a bear walk by. I didnt even panic because I knew what she meant. She didnt mean a real bear, she meant the spirit of a bear. I told her I wasnt sure if any bears lived in that area of Oklahoma — but I didnt really think so — and we kept walking. After trekking about a mile or so on the novice hiking tracks, we decided we would turn back as it was getting late. We were walking back through the woods, when I suddenly saw a bear to the left of me. R was ahead of me, so I asked her to stop for a minute. I asked her if she thought my current position was the same place she had seen the bear, and she said it was. Then I asked, was it like a smaller bear? A black bear?, and she once again said, yep!. Then I promptly replied, I dont know what that was all about, but I just saw him too! cool!. We continued walking and headed for the car. That night we went to a small town called Blair for some pizza. Keeping on par with the other synchronistic events of the trip, it just so happened that our waitress was a budding psychic and was in the beginning stages of developing her ability. She was standing at our table, and as we talked about whatever, she mumbled something under her breath about a man sitting next to me. Much to her embarrassment, I told her I had heard the comment. I also told her what I did for a living and I was interested to get her take on who it was she thought she saw sitting beside me. Okay, lets be honest here — I was testing her out trying to see how good she was. She said she wasnt sure of his name and couldnt make it out because he was talking funny. I asked what she meant about him talking funny, and in her next comment she said, you know, how Indians talk — they have sort of an accent. I clarified she meant Native American Indian, asked the name she heard, and then looked at R and just started laughing. Your pretty good!, I said. After explaining how accurate she had been and encouraging her to keep up with her psychic stuff, we ate our pizza and headed back to the hotel. I am talking huge alien craft in the sky amongst the stars. I began screaming, Oh my god, Oh my god! R you have to come look at this! Hurry! Hurry! Get over here quick!. I have seen some UFOs in my time, but never have I seen anything like this before — not to mention, so close and just there. This craft was as big as an aircraft carrier. I am talking freaking huge!. Have I told you it was huge?? I stood there frozen, both mesmerized and freaked out about what I was seeing. The whole experience must have lasted only a few seconds, but I saw it. It had lights going around it, flashing almost like a Christmas tree. I didnt dare break my gaze, and all of a sudden, almost as If they knew I was watching them, the lights all went off one by one — but extremely quickly. I heard sort of a low tone when everything powered off and the entire craft went black. By the time R made it over to the door, the Alien Ship had already gone completely black. I was just absolutely reeling that I got to see this craft for what seemed like at least 30 seconds, and I got to see it so clearly. It was like the movies. Incredible!! Wow what an experience! I caught my breath and told R what had just happened, and that I thought it was still there and parked up in the sky. I was excited, nervous and curious all at the same time. I wondered why I was the one who got the privilege to see it — after all, there were several people walking around outside that night. I even speculated if it perhaps was there hovering above the Quartz Mountains to get some type of energy — like filling up at a gas station or something similar to that. I am laughing right now thinking gosh whoever is reading this most likely is thinking I have totally lost the plot!. Perhaps I am losing the plot somewhat, but it did happen! The story has even more intrigue as ironically enough, when I told R I felt the craft was still there and parked in the sky — she actually, without any hesitation pinpointed the exact location where I thought the craft was. Amongst millions of other stars in the sky, there were three particular ones that stood out and made the shape of a triangle. We both had the notion that although these lights looked like stars, they actually outlined the ship — as if the ship itself was disguising itself amongst the stars. Pretty groovy aye?! I thought so! That night the wind was furious — it howled and whistled unceasingly. Needless to say, between the eerie sound of the wind and being worried about getting sucked up by an alien — that night I got absolutely zero sleep. Our stay in the Quartz Mountains had regrettably come to its end. We were sad and very reluctant to go, but unlike me, my friend has a real job with real hours, so we had to start making our way back to Dallas. We began gathering our things together very slowly. We stretched it out as long as we could, and then finally left at checkout time. We packed the car, took our final gaze at the beautiful landscape, and started driving slowly out of the area. I waved goodbye as we drove past the brown sign saying, Leaving the Kiowa-Comanche-Apache Reservation. I didnt linger too much on my disappointment as I knew I would be there again very soon, and after all, we werent finished yet — we still had another stop at Fort Sill. The scenic drive went by very quickly, and once again we found ourselves at the entrance of Fort Sill. This time would be a little different, because not only did we know where we were going — everything was actually open! We parked the car, jumped out and headed straight for the Information Center. There was a really lovely guy at the entrance who immediately asked us to sign the visitors list. He handed us a map of the square and spoke very quickly about locations we might want to visit while on the base. I told him I was there specifically to learn more about Big Tree and the Kiowa Indians, but unfortunately, I didnt think he was paying much attention to what I said. He seemed to be intent on rushing us off into a room where a movie about the history of Fort Sill had already begun. As I watched the movie, I became excited when they began discussing the details and arrest of Big Tree — not to mention — there he was, his face was plastered on a huge movie screen! The film was still playing, but almost immediately after the part about Big Tree and the Kiowa Indians finished, I saw a flash of light as the door in the back of the theatre opened. It was completely dark in the theatre again, so I just figured it was someone coming in late to the presentation. All of the sudden, I jumped in my seat as I felt a tap on the back of my shoulder. It was the man from the Information Desk. He crouched down beside me and began speaking in my ear. He told me the Curator of the museum just happened to be there that day, and then asked if I would like to accompany him on a private tour. 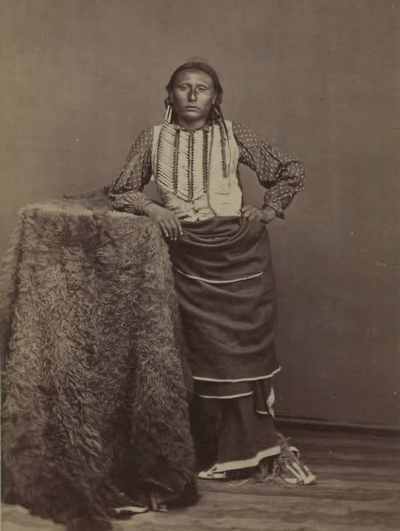 In addition, he also mentioned we would be going to a building that was restricted from the public, and where I would get to see more artifacts relating to Big Tree and the Kiowa Indians. I sat in my seat for about a whole nanosecond longer as the thoughts began circling around in my head. Are you serious?! Would I like to go?! Are there trees in the woods? Wow! I was really thrilled! I didnt even think he had paid any attention to what I had said at the desk — but apparently, he was kind enough to intuit how important this visit was to me. Without a moment of hesitation, R and I both bolted out of our seats and walked behind him, as we headed for the door. We quickly ran outside and caught up to the Curator who was already walking toward the building with two other people. He introduced himself as T, and from the moment I saw him, I knew he would be an integral part of my journey. He had an interesting olde-worlde energy, and I could tell he was a walking encyclopedia of information. I made sure when I introduced myself, I let him know I was interested in learning more about Big Tree. We first toured one of the buildings that used to be utilized as one of the old Army Barracks. Apparently the guy along with us was one of those reenactment dudes, so we got to look at a lot of old uniforms and learn about various aspects of a soldiers life. The conversation was very interesting and informative — but I kind of felt like this guy and I were at cross purposes — he, being interested in everything Army Soldier American History and I, being interested in everything Native American Indian History. R who knows me like a book, and always manages to clock on to my thoughts, looked over at me and laughed. She knew what I was thinking, and I knew, that she knew, I knew what she was thinking! Trying to keep our composure and not burst out laughing, we walked around for a little while longer, and then all of us made our way towards another building. When we reached the next building, the Curator, T, pulled out his set of keys and unlocked the door. As he was opening the door, he glanced back at me, gave me a big smile and said, You are going to love this!. We began walking through the building, and as we got to one particular area, I started getting really queasy and felt like I was about to be sick. I noticed also, that my feet had become very heavy and I found myself dragging them along as if they were bound by shackles. I started getting really, really dizzy as I always do when I am near a point of high psychic energy. I wasnt sure what was going on, or what I was supposed to glean from experiencing these symptoms in this specific building. I had to stop — I just couldnt move any further. I stood there paralyzed, dead in my tracks as tears began rolling down my face. I felt anxious and I found myself biting my fingers as I suddenly had also become very nervous. that is interesting — we are standing over the very spot where Big Tree was held captive. I thought in my head a-ha! I didnt realize it when we entered the building, but as T the Curator explained to me — apparently this building was used as the original jail and holding cells before the Guardhouse had been built. I managed to regain my composer and continued on walking with the Curator. 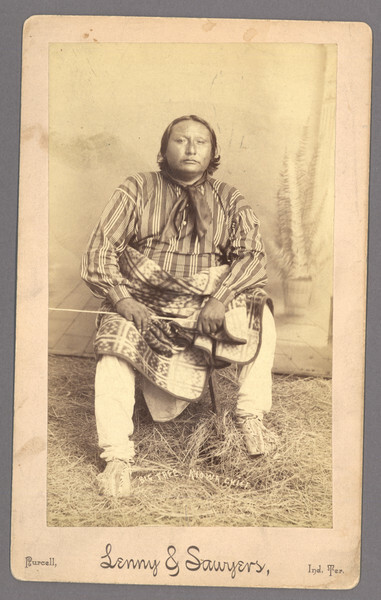 He took me straight over to a display and showed me a War Shield that belonged to Satanta and a photo of Big Tree I had never seen before. Along with the other Kiowa artifacts, T also showed me some items and clothing that belonged to Quanah Parker. I was in my own private heaven. I was thrilled beyond belief to see all these things so close up and personal. How lucky I was to be there and how grateful I was to both the Information Desk Guy and to T the Curator, for his knowledge, his time, and his allowing me to come along on this special tour. My journey had come full circle, and I now felt a sense of contentment as though everything was complete. Once again time was passing very quickly, and we knew we had better be making a move soon. R and I thanked the Curator, the Information Desk Guy, made a quick stop at the gift shop — then saddled up in our little red horse and headed away from Fort Sill. We were both in extremely high spirits after having had such an amazing week. We talked incessantly while traveling down the road, as we reminisced about our marvelous adventures, and all the wonderful people we had encountered on our journey. We ultimately began to wind down, and realized we were ready to stop for a break. We got out the map to check our current location, and lo and behold — there it was! We were heading right back into Jacksboro, Texas — right back to the beginning! For an instant, my thoughts wandered to how profoundly changed I had become since our initial visit. Even though my life would now be very different — I quickly realized, some things are sacred and will always stay the same. Can you say rice, beans, guacamole, homemade tortillas and cheese enchiladas? © 2011 by Kathleen A. McCoy. All rights reserved. No part of this document may be reproduced or transmitted in any form or by any means, electronic, mechanical, photocopying, recording, or otherwise, without prior written permission of Kathleen A. McCoy. Thank you for your remark. How fascinating you grew up around Rainy Mountain and are a descendant of Millie Durgan. My knowledge of her is very limited. However, from what I do know – her story is an interesting one! This is very interesting to me. I grew up around Rainy Mountain Church. My family is buried in the New cemetery and others in the KCA cemetery. I’m a descendant of Millie Durgan, she is buried there.